Clara van Karnebeek, MD PhD FCCMG works per 2017 as certified pediatrician and biochemical geneticist at the Emma Children’s Hospital, Academic Medical Centre in Amsterdam, The Netherlands. She is also a Principal Investigator at Centre for Molecular Medicine and Therapeutics in Vancouver Canada, and a Michael Smith Foundation for Health Research Scholar. She is affiliated as associate professor with the University of British Columbia. In the TIDE-BC program (www.tidebc.org), Clara integrates her clinical work with research to promote early diagnosis and treatment of neurometabolic diseases in children presenting with intellectual developmental disorders. She developed a diagnostic protocol supported by the Treatable ID App (www.treatable-id.org) for identification of more than 90 treatable inborn errors of metabolism presenting with intellectual disability, which has been incorporated in (inter-)national guidelines. Furthermore, her international team integrates genomic and metabolomics technologies to unravel neurometabolic phenotypes and has discovered novel genetic conditions (e.g. carbonic anhydrase VA deficiency presenting with neonatal hyperammonemia, NANS deficiency with ID plus dysostoses). In a 2016 New England Journal of Medicine article, her team illustrates how genomic diagnosis enables targeted treatments for a subset of patients with neurometabolic disease. She has a special interest in the treatment of pyridoxine-dependent epilepsy and creatine deficiencies, and the use of digital tools to enhance rare disease care. More recently, Clara has established with Amsterdam and Canadian colleagues, a research program focused on phenotypic modifiers for neurodegenerative diseases such X-linked Adrenoleukodystrophy. Clara enjoys teaching and supervising students in clinical medicine and basic science. She has published over 80 peer-reviewed journal articles, multiple clinical guidelines and several chapters in neurology textbooks, holds multiple national and international research grants, and is regularly invited to lecture at international conferences. Her contributions to research and clinical care have been recognized by the Canadian Organization for Rare Diseases (Scientific Award 2016), the University of British Columbia Faculty of Medicine (Overall Excellence Early Career Award 2016) and nomination for the YWCA Women of Distinction Award 2017. The burden of intellectual developmental disorders, in terms of emotional suffering and associated health care costs, is significant, making diagnosis and treatment crucially important. There exist many different environmental and genetic causes of IDD. Here we discuss those genetic forms of IDD that are amenable to treatment that directly targets the underlying cause, or “causal therapy”. Inborn errors of metabolism (IEMs) are the largest group of treatable causes of intellectual developmental disorders and new IEMs are being identified all the time: in 2014, 89 were identified. In 2016, that number exceeded 100 and the number is growing. Inborn errors of metabolisms are enzymatic defects that cause problems in the conversion of the foods we eat (fats, carbs, protein) into energy and building blocks. This disruption in regular processes of absorption and breakdown of molecules also allows for the build-up of toxic molecules. All three mechanisms can affect the brain, resulting in intellectual developmental disorders. A diagnostic protocol and app have been developed to enhance early recognition of these treatable IEMs. Evidence from a recent study shows the frequency of these treatable conditions in the IDD population is 5%. This gives hope, especially with the advances being made in diagnosis and treatment. Emerging therapies and ongoing clinical trials offer hope for the future. Together with IEMs, these conditions are referred to as treatable neurodevelopmental conditions. Global developmental delay with deficits in two or more developmental domains (such as speech/language and motor skills) at 5 years of age or older. severe to profound (IQ of less than 35). Overall, intellectual developmental disorders affect 2-2.5% of the population worldwide. The disease category is associated with the largest health care costs – almost equal to the economic impact of stroke, heart disease, and cancer combined. Children with intellectual developmental disorders learn more slowly than typically developing children. These learning deficits generally apply to many kinds of learning across different developmental stages. Young children with IDD may learn to sit up, crawl, walk, or talk later than other children. Most have difficulties developing communication skills, as well as trouble interpreting and applying new information, and often have trouble keeping up in school. Older children with intellectual developmental disorders may demonstrate deficits in memory, social, and problem-solving skills. A lack of social inhibitions may also be a sign that a child has IDD. This is not because the child is “acting out” or “rebelling,” but because he/she has difficulties interpreting the signs as to what kinds of behavior are appropriate in each situation. Children with IDD often have more difficulty with adaptive skills or tasks of daily living, than do typically developing children. Standardized tests, such as an IQ test, are used to determine a child’s level of intellectual development. A score below 70 on a standardized IQ test indicates that he may have IDD. To be officially diagnosed, the child must also exhibit deficiencies in two or more specific areas of adaptive behavior, such as communication, interpersonal, or daily living skills (getting dressed and using the bathroom). The onset of IDD usually occurs before birth unless it is accounted for by a specific injury or toxic exposure before the age of 18 years. Organs outside the central nervous system can also be affected. IDD and its comorbidity result in a considerable psychological, social, and economic burden to patients and families. In most cases, people with IDD continue to learn and acquire new skills. Progressive disease, including deterioration of cognition and loss of skills, only occurs in a minority of cases. This can be a sign of serious underlying illness that may negatively impact life expectancy. Intellectual developmental disorders have many causes and identifying its origin in a child can present a challenge to clinicians. Intellectual developmental disorders may occur in fetal life or any time thereafter and can include environmental and acquired toxin exposures such as harmful hits to the fetal brain due to alcohol (fetal alcohol syndrome) or infections during pregnancy or later in life. However, more than 50% of reported IDD is genetic in origin. Genetic causes by themselves are numerous and complex. Determining the exact genetic issue requires a variety of tests done by many different specialists. Chromosome micro-array (a detailed study of all chromosomes for missing or extra chromosome pieces) and, more recently, whole exome/genome sequencing, which allows for analysis of all letters of the DNA code, are technologies that have revolutionized the diagnostic process for patients with intellectual developmental disorders. Finally, a diagnosis allows for refined patient management and, for a subset of genetic conditions, treatment targeting the disease mechanisms. Targeted treatment of intellectual developmental disorders may improve health and developmental outcomes and reduce the burden of IDD for the individual, family, and society. cognitive-behavioral, occupational, speech and physical therapy. Inborn errors of metabolism (IEMs) constitute the largest group of causally treatable IDDs. Population frequencies vary from 1:10,000 for phenylketonuria to less than 1:250,000 for guanidinoacetate methyltransferase (GAMT) deficiency. IEMs are a diverse group of rare genetic conditions that result from the defective activity of an enzyme or enzymes that are important to the functioning of cells. These enzymes have roles in the synthesis, conversion, or degradation of essential chemicals in the affected cells, tissues, and fluids. A defective enzyme causes energy depletion that affects all the body’s organs. The brain is particularly affected as it uses a lot of energy, and a buildup of toxic metabolites in the brain can cause irreversible brain damage. As well, the building blocks that the body and brain need to grow can also be missing (Figure 1). All these factors can result in IDD. Figure 1. Illustration of the 7 different therapeutic strategies for inborn errors of metabolism; one or a combination will be used to overcome the abnormalities caused by the characteristically impaired chemical intracellular transformations (synthesis or breakdown of molecules, accumulation of toxic molecules, lack of cell energy, or necessary substrates). Treatments are being developed and in clinical trial phase for other genetic neuro-developmental conditions that are not IEMs, such as Fragile X syndrome. These are discussed later in this article. The type of treatment depends on and is specific to each rare IEM. Most treatments are affordable (e.g., diet and vitamin/supplements) which do often require lifestyle adaptations. Others include more costly medications (small molecules, substrate inhibitors), or more invasive interventions such as stem cell therapy and gene therapy. Only one of the rare diseases requires an expensive medication (substrate inhibitor); enzyme replacement therapy as causal treatment for intellectual developmental disorders is not on our list as it does not cross the blood brain barrier, i.e. from the bloodstream into the brain tissue. 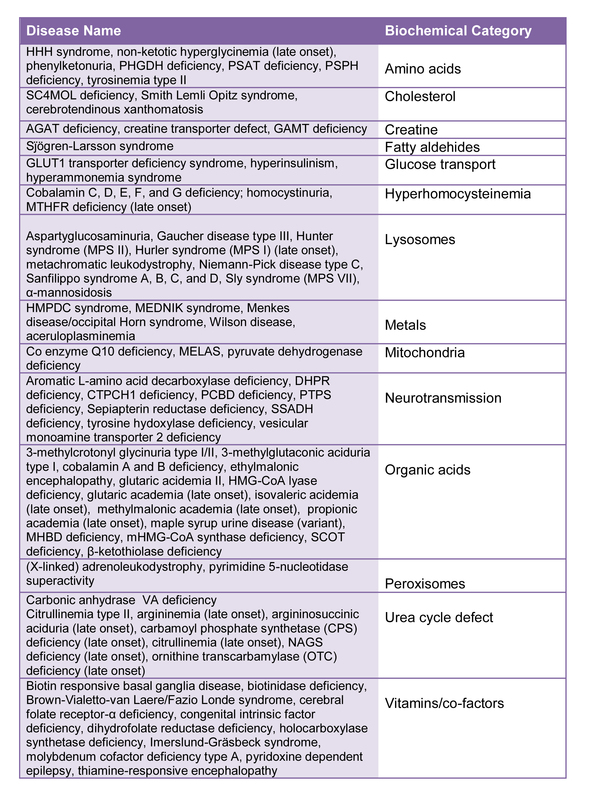 Table modified from Table 1: van Karnebeek CDM, Bowden K, Berry-Kravis E. Treatment of neurogenetic developmental conditions: from 2016 into the future. Pediatr Neurol 2016;65:1-13. Table 1. Biochemical categories for inborn errors of metabolism. However, it is important to note that non-neurologic or systemic features are a prominent phenotype in 57 (64%) of the 89 treatable inborn errors of metabolism. Other presentations vary from ‘stable intellectual developmental disorders’ (i.e., without a history of regression or plateauing) to neurodegenerative with or without multi-organ involvement. The timing and nature of onset also varies. Some IDDs are characterized by a sudden worsening of signs and symptoms – often in the neonatal or early childhood period – while others present with a ‘late onset’ form of non-specific disease that is chronic in nature. Medical specialists (pediatricians, neurologists, geneticists) can identify or rule out treatable inborn errors of metabolism by doing a clinical exam and requesting specific laboratory tests. To support the doctors in this process, a two-tiered protocol (Figure 2) was developed through the Treatable Intellectual Disability Endeavour (TIDE (www.tidebc.org)). TIDE was a 5-year funded clinical research project at BC Children’s Hospital in Vancouver, Canada that was designed specifically to enhance early diagnosis of treatable IEMs in children presenting with intellectual developmental disorders. In the TIDE protocol, the first diagnostic tier involves biochemical testing of blood and urine (costs ~$410), which potentially identifies 60% of the currently known treatable conditions. It should be applied in all patients with unexplained IDD. Figure 2: 2-tiered algorithm for diagnosis of treatable inborn errors of metabolism in intellectual developmental disorders. The first tier testing comprises group metabolic tests in urine and blood which should be performed in every patient with intellectual developmental disorders of unknown cause. Based on the differential diagnosis generated by the patient’s signs and symptoms, the second tier test is ordered individually at a low threshold. The next step is to apply the 2014 diagnostic practice parameters for IDD, which include chromosome microarray as a first-line test and, in selected cases, Fragile X testing, neuroimaging and other tests. This should be done in combination with the second tier of the TIDE algorithm for the identification of the remaining 35 treatable IDDs (Figure 2). The latter 35 conditions require a more targeted/selective approach, which includes single metabolite or primary molecular analysis, based on a clinical differential diagnosis, i.e. the presence of signs and symptoms. These tests often require more invasive sampling procedures and/or extensive funding. A free digital application is available for clinicians (via www.treatable-id.org and the Apple App store as the TIDE-BC App). It supports the diagnostic algorithm and provides information on the symptoms, tests, and treatments of these rare diseases. Application of the TIDE protocol identified a treatable inborn error of metabolism in 5-6% of 500 patients with unexplained intellectual developmental disorders, who were evaluated in a tertiary care centre. This resulted in reduced diagnostic costs and delays when compared to previous practice. Notable especially is the frequency of creatine deficiency syndromes which compares to Fragile X syndrome, affecting up to 2% of males with IDD. Once exome sequencing is established as the primary diagnostic test, sufficient coverage of treatable IEM encoding genes is essential so as not to miss a diagnosis impacting management and outcomes. The occurrence of seizures, possibly preceded by other major symptoms such as a reduced level of consciousness, a loss of skills, progressive weakness, ataxia, or upper motor signs may be the first and major presenting features of an inborn error of metabolism. While specific seizure types characteristic of individual IEMs is rare, the common metabolic causes of seizures vary according to the age at which they begin to appear and/or involvement of specific cortical areas of the brain. Features from the history, examination, imaging, and first line biochemical investigations can all provide clues as to which IEM may be involved. The response to targeted metabolic therapy differs amongst IEMs and outcomes depend on the manifestation of the disease. In some people, seizures are a consequence of acute metabolic stress on the central nervous system (e.g., in the case of hyperammonemia or hypoglycemia). In these cases, treatment of the underlying neurometabolic condition can reduce or eliminate the seizures. In other treatable IEMs seizures are the main sign and disease progression can lead to drug-resistant epilepsy (e.g., GAMT deficiency). In a few metabolic disorders such as phenylketonuria (PKU) or biotinidase deficiency, seizures can be prevented altogether if caught early (e.g., via newborn screening) and treated (biotin). However, conventional antiepileptic medications may be needed in addition to metabolic therapy for some IEMs (e.g., glutaric aciduria type 1). For example, the early diagnosis and treatment of PKU (e.g., diet and sapropterin/BH4) can be highly effective, however there remains a need for additional treatments, many of which are in clinical trials, including PEG-PAL, liver cell transplants, and gene therapy. A significant number of IEMs (n=67) present with symptoms that mimic cerebral palsy (i.e. spasticity, dystonia, movement disorder, basal ganglia lesions, etc. before the age of 5 years) and respond to causal therapy. An example is the neurotransmitter defect tyrosine hydroxylase deficiency, which responds very well to treatment with L-dopa. In fact, early intervention with L-dopa has shown dramatic improvements and even reversal of symptoms. Diagnosis of cerebral palsy is traditionally based on the predominant quality of motor impairment assessed on a standard neurologic exam (i.e., spastic, dyskinetic, ataxic-hypotonic or mixed. However, there are several ‘atypical’ findings (relating to a pattern of inheritance, absence of history of perinatal injury, or a pattern of symptoms indicating developmental regression or progression/worsening of symptoms) or symptoms (isolated muscular hypotonia, rigidity, or paraplegia) which should prompt the doctor to search for an underlying inborn error of metabolism. 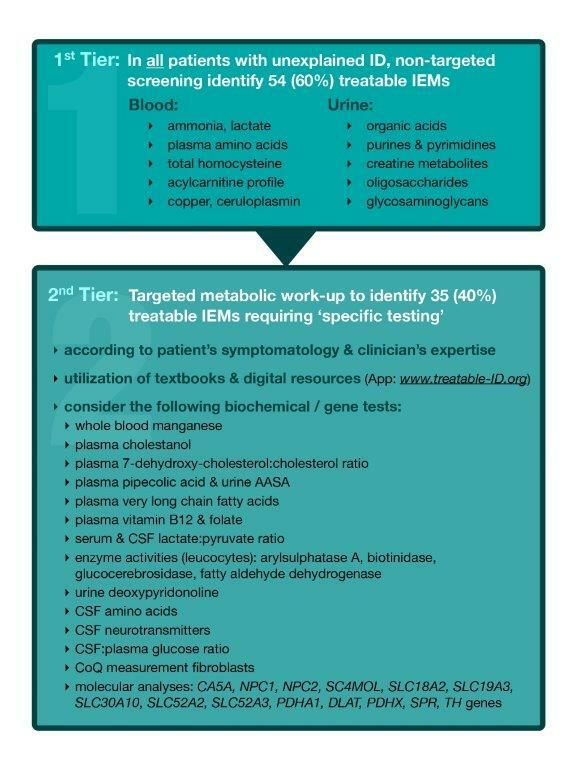 In these situations, metabolic and molecular testing are required for diagnosis following the TIDE protocol (Figure 2). chronic (e.g., Wilson’s disease, Niemann-Pick disease type C, homocystinuria due to cystathionine beta-synthase deficiency, cerebrotendinous xanthomatosis). Currently, several emerging therapies for IEMs are on the horizon and in various phases of clinical trials. For example, 2-hydroxypropyl-beta cyclodextrin treatment of Niemann-Pick disease type C has shown early evidence of potential efficacy in a phase I open-label human trial leading to initiation of a phase II/III trial (NCT01747135) currently underway. Combined intrathecal and intravenous enzyme replacement therapy is ongoing for several storage diseases including late infantile neuronal ceroid lipofuscinosis, mucopolysaccharidosis types I and II (NCT00638547; NCT00920647). The first successful administration of adenovirus-associated virus (AAV-)delivered gene therapy was reported for lipoprotein lipase deficiency and is now approved for clinical use in Europe. This approach is being developed in the context of neurogenetic developmental conditions (NDCs) such as X-ALD (NCT 25592337), PKU, Sly syndrome (MPS VII) among others. The parabenzoquinone analogue EPI-743 targets reduced intracellular glutathione, which has a protective effect against cellular oxidative stress, and has been shown to positively impact the natural history of several mitochondrial disorders. EPI-743 and other compounds that target redox abnormalities associated with mitochondrial dysfunction hold promise for this large group of debilitating diseases. Advances in gene delivery methods are enhancing the effectiveness of gene therapy. For example, Safdar and colleagues found that delivery of alpha-glucosidase transcript inside exosome microvesicles restores enzyme activity in Pompe disease cells. Finally, organ (liver or kidney) transplantation, as well as hematopoietic stem cell transplantation (HSTC), are becoming safer and more effective as treatments for IEMs. New techniques are being implemented in combining stem cell transplant with gene therapy (e.g., in immune deficiency syndromes) but are not yet in clinical trials for IEMs. This combined approach increases overall expression and synthesis of the gene product and increases enzyme activity for greater effect. It is worth noting that these types of targeted therapies come at a price and may be significantly more expensive and potentially invasive. However, if implemented early in the disease course, they may result in a cure or prevention of neurogenetic developmental conditions altogether. What is the prognosis for inborn errors of metabolism? The prognosis for IEMs is highly variable. It depends on the type of IEM, the severity, and symptoms, whether there is progressive course, the age at diagnosis, and the amenability to treatment, when the treatment is initiated and how well it works. 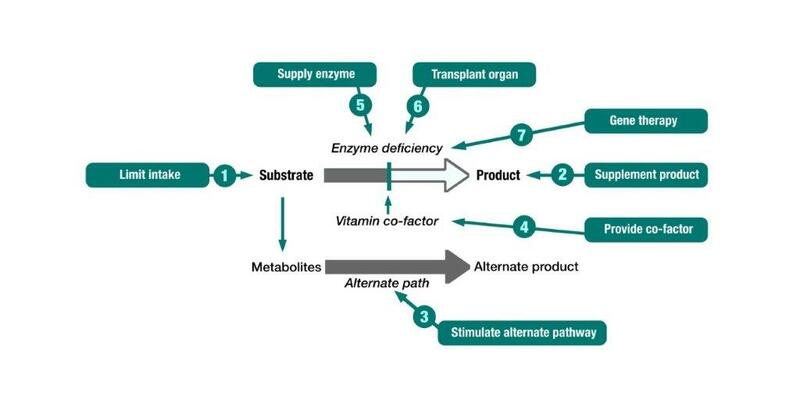 In general, some treatments are effective if started early in life, e.g., creatine supplementation for L-arginine:glycine amidinotransferase (AGAT) deficiency deficiency and protein restriction for Phenylketonuria (PKU). However, treatments for other IEMs have limited effects, especially if started at a more advanced stage of the disease. Even for similarly affected individuals within the same family who have the same genetic disease, the prognosis might be different. The medical specialist with expertise in IEMs who has evaluated your child can best provide information on prognosis. Potential treatments for several other neurogenetic developmental conditions of genetic (non-metabolic) origin have recently emerged. Increased glutamate levels in the cerebospinalfluidhave been linked with RS and may relate to hyper-excitability related phenomena, such as epilepsy. Treatment: Several IGF-1 analogues have shown an affect in early studies for the treatment of RS and are now being developed for treatment of the disease. A phase 1 trial of mecasermin (recombinant human IGF-1) showed good safety in girls with an increase in CSF IGF-1 levels, and improved apnea, anxiety and mood scores. No hypoglycemia or serious adverse events were reported (study # NCT01253317, www.clinicaltrials.gov. Treatment: There is an unmet need to develop effective causal therapies to improve learning, memory and speech in individuals with Down syndrome, which would improve their functioning and increase independence. A selective orally active GABAA α5 receptor subunit inverse agonist (RG1662) is currently under development to reverse cognitive deficits in DS. RG1662 has demonstrated good safety in a phase 2a study (study # NCT01920633,) and is currently in a phase 2b efficacy trial targeting memory, language and cognition in adults and adolescents with DS. Studies of this compound in children with DS are also planned (study # NCT02024789). This genetic multisystem disorder is caused by a mutation of either of the genes TSC1 or TSC2. It is associated with growth of benign tumors in organs and tissues. Other symptoms include dermatologic manifestations such as shagreen patches or hypopigmentation, epilepsy, autism spectrum disorder, intellectual developmental disorders, and other behavioral problems. The central nervous system is commonly involved, with brain MRI frequently showing structural abnormalities such as cortical tubers and subependymal nodules, which can develop into subependymal giant cell astrocytomas. Treatment: Sirolimus (rapamycin) and everolimus (a rapamycin analog) have been used successfully to reduce the size of renal angiomyolipomas and subependymal giant cell astrocytomas) in clinical trials in adults with tuberous sclerosis complex. An open-label trial of everolimus showed a clinically relevant reduction of seizure frequency and duration, improved white matter integrity, as well as improved behavior and quality of life. A placebo-controlled phase II study is currently in progress to assess the effect of everolimus on neurocognition, seizures, sleep, autism spectrum disorder, behavior, and academic skills (study #NCT01954693). This syndrome is the most common known genetic cause of intellectual developmental disorders and autism spectrum disorder, with an estimated frequency of 1:4000-5000 affecting all ethnic groups worldwide. Fragile X syndrome is caused by a trinucleotide repeat (CGG) expansion mutation of more than 200 CGG repeats in the promoter region of FMR1 (Fragile X mental retardation 1 gene). Females with Fragile X syndrome are affected less severely than males. AFQ056 suggested improvement in maladaptive behavior over placebo in a post-hoc analysis in the subgroup with full methylation of FMR1. Larger placebo-controlled trials of arbaclofen (study #NCT00788073), AFQ056 (studies #NCT01357239, NCT01253629) and RO4917523 (mGluR5 NAM, study # NCT01517698), for 3 months in adults and adolescents with FXS (clinicatrials.gov) have not shown behavioral benefit but have not addressed cognitive or learning outcomes. A phase 3 arbaclofen trial in children with Fragile X syndrome (study# NCT01325220) showed improvements in behavior and reductions in parental stress in the highest-dose group relative to placeb, but full analyses are pending. Table 2. Targeted Treatments in Clinical Development by 2015 for Genetically Defined NDCs. This genetic condition is characterized by developmental delay within the first year of life, movement disorder manifested as ataxia and a stiff jerky gait, absence of speech and spells of laughter. Autism spectrum disorder and seizures are common comorbidities, occurring in more than 80% of patients with autism spectrum disorder. 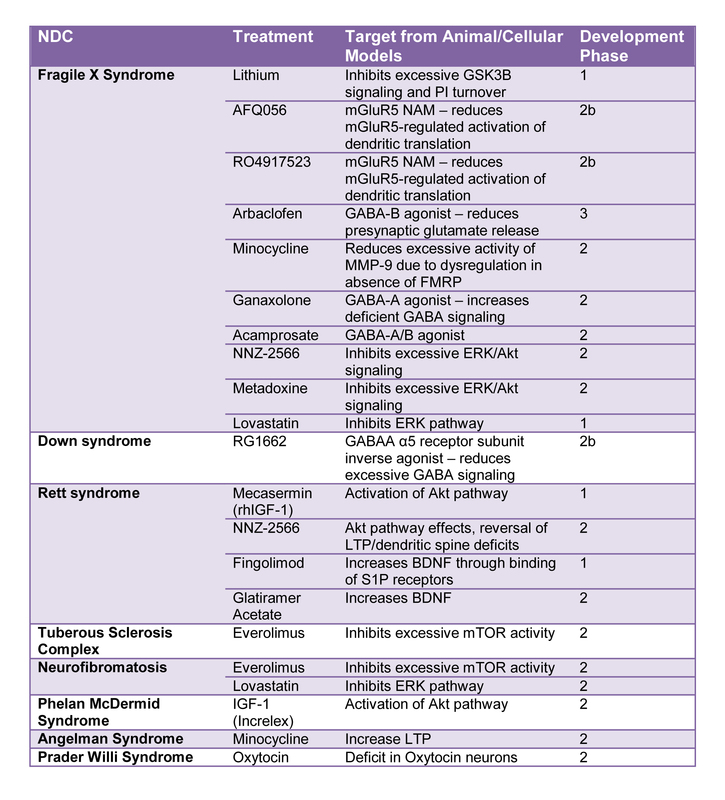 Angelman syndrome is caused by disruption of the maternally inherited or parentally imprinted E3 ubiquitin ligase UBE3A (chromosomal region 15q11-q13). Treatment: Current therapy for Angelman syndrome is supportive and includes interventions to reduce motor delay, augmentative communication strategies, treatment of seizures and psychopharmacology for behavior. However, results of a recent pilot trial of minocycline in 25 children with AS are promising, with improvements in fine motor skills and communication, specifically in auditory comprehension and language ability. Prader-Willi Syndrome (PWS) is a complex neurogenetic developmental condition, caused by similar genetic disruptions of chromosome 15q11-q13, as seen in with Angelman syndrome, People with Prader-Willi syndrome have reduced oxytocin production in the hypothalamic paraventricular nuclear region of the brain. Treatment: Pre-clinical trials of oxycontin have shown some efficacy; however, a double-blind randomized placebo-control trial in 30 patients with Prader-Willi syndrome who received intra-nasal doses of oxytocin showed no significant effect in impulsive or anti-social behavior. The effectiveness of oxytocin as a treatment for Prader-Willi syndrome with respect to feeding behavior is still under question. This rare neurogenetic developmental condition is characterized by neonatal hypotonia, feeding difficulties, gait disturbances, physical dysmorphic features, intellectual developmental disorders with absent or delayed speech, seizures and autism spectrum disorder in more than 80% of cases. Phelan-McDermid syndrome is caused by deletions within chromosome 22q13.3 that result in haplo-insufficiency of SHANK3, as well as point mutations within SHANK3. Treatment: A pilot placebo-controlled study of IGF-1 in 9 children with Phalen-McDermid syndrome showed significant improvement in social impairment and restrictive behaviors, providing a basis for larger studies. This condition is a rare tumor predisposition syndrome that results from mutations in the NF2 tumor suppressor gene. Patients develop bilateral, vestibular schwannomas resulting in associated hearing loss, tinnitus and/or balance issues. Treatment: A phase II clinical study treating NF2 patients with everolimus for 12 months or longer suggested a stabilizing effect with slowing of tumor progression over the course of treatment. Like inborn errors of metabolism, the prognosis for these non-metabolic neurogenetic developmental conditions is also highly variable. An individual’s prognosis depends on the type of NDC, the severity and symptoms, the age at diagnosis as well as the amenability to treatment, when treatment is begun, and how well it works. In contrast to inborn errors of metabolism, most of the above treatments for NDCs are in very early stages or being tested in clinical trials. However, these studies offer hope for future evidence-based treatments to improve the lives of individuals with these devastating rare diseases. The medical specialist with expertise in the neurogenetic developmental disorders, who has evaluated your child, can best provide information on prognosis. Asthagiri AR, Parry DM, Butman JA, K et al. Neurofibromatosis type 2. Lancet 2009;373:1974-86. Berry-Kravis E. Mechanism-based treatments in neurodevelopmental disorders: fragile X syndrome. Pediatr Neurol 2014;50:297-302. Bolton SM, Campbell KM, Kukreja M, et al. Neurologic outcome of urea cycle disorder liver transplant recipients may be predicted by pretransplant neurological imaging. Pediatr Transplant 2015;19:527-30. Bonnot O, Klunemann HH, Sedel F, et al. Diagnostic and treatment implications of psychosis secondary to treatable metabolic disorders in adults: a systematic review. Orphanet J Rare Dis 2014; 9:1172-9. Fernandez F, Morishita W, Zuniga E, et al. Pharmacotherapy for cognitive impairment in a mouse model of Down syndrome. Nat Neurosci 2007;10:411-3. Fountain MD, Jr, Schaaf CP. MAGEL2 and oxytocin-implications in Prader-Willi syndrome and beyond. Biol Psychiatry 2015;78:78-80. Gross C, Hoffmann A, Bassell GJ, et al. Therapeutic strategies in Fragile X syndrome: from bench to bedside and back. Neurotherapeutics 2015;12:584-608. doi: 10.1007/s13311-015-0355-9. Harony-Nicolas H, De Rubeis S, Kolevzon A, et al. Phelan McDermid syndrome: from genetic discoveries to animal models and treatment. J Child Neurol 2015;30:1861-70. Julich K, Sahin M. Mechanism-based treatment in tuberous sclerosis complex. Pediatr Neurol 2014;50:290-6. Leach EL, Shevell M, Bowden K, et al. Treatable inborn errors of metabolism presenting as cerebral palsy mimics: systematic literature review. Orphanet J Rare Dis 2014; 9:197. Maass F, Petersen J, Hovakimyan M, et al. Reduced cerebellar ne urodegeneration after combined therapy with cyclodextrin/allopregnanolone and miglustat in NPC1: a mouse model of Niemann-Pick type C1 disease. J Neurosci Res 2015;95(3):433-42. Margolis SS, Sell GL, Zbinden MA, et al. Angelman syndrome. Neurotherapeutics 2015; 12(3):641-50. Moeschler JB, Shevell M, Committee on Genetics. Comprehensive evaluation of the child with intellectual disability or global developmental delays. Pediatrics 2014;134(3):e903-18. Naldini L. Gene therapy returns to centre stage. Nature 2015;526(7573):351-60. Rahman S, Footitt EJ, Varadkar S, et al. Inborn errors of metabolism causing epilepsy. Dev Med Child Neurol 2013;13(7):23-36. Safdar A, Suri R, Nasli A, et al. Therapeutic potential of exosomes in Pompe disease: treatment of tomorrow, today for lysosomal diseases. Mol Genet Metab2015;114(2):114:S11. Strisciuglio P, Concolino D. New strategies for the treatment of phenylketonuria (PKU). metabolites 2014;4(4):1007-17. Tarailo-Graovac M, Shyr, C, Ross CJ, et al. Exome sequencing and the management of neurometabolic disorders. N Engl J Med 2016;373(23):2246-55. doi: 10.1056/NEJMoa1515792. van Karnebeek CDM, Stockler S. Treatable inborn errors of metabolism causing intellectual disability: a systematic literature review. Mol Genet Metab 2012;105(3):368-81.
van Karnebeek CD, Shevell M, Zschocke J, et al. The metabolic evaluation of the child with an intellectual developmental disorder: diagnostic algorithm for identification of treatable causes and new digital resource. Mol Genet Metab 2014;111(4):428-38. Wolf NI, Bast T, Surtees R. Epilepsy in inborn errors of metabolism. Epileptic Disord 2005;19(1) 67-81. *The author wishes to acknowledge the work of Elizabeth Berry-Kravis, MD, PhD for material that supports information included in the body of this chapter. Dr Sylvia Stockler-Ipsiroglu and Dr Kristin Bowden (University of British Columbia) are acknowledged for their contributions relevant to this topic, and Ms. Claire Sowerbutt for her edits to the current webcontent.